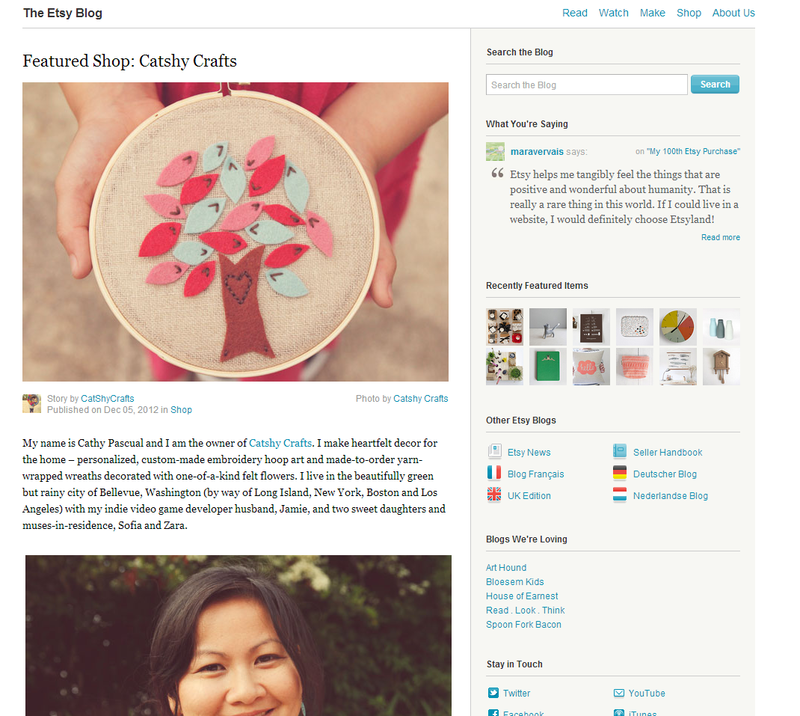 Catshy Crafts: Catshy Crafts is Featured Shop at Etsy! 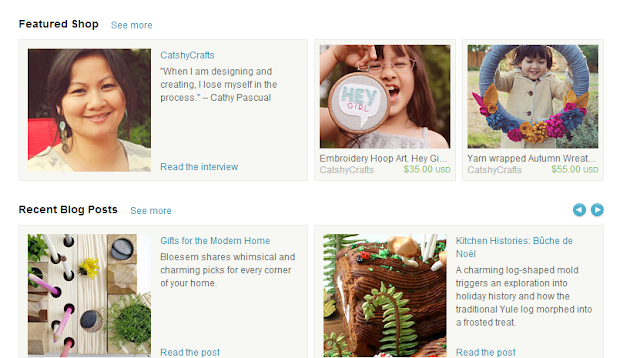 Catshy Crafts is Featured Shop at Etsy! 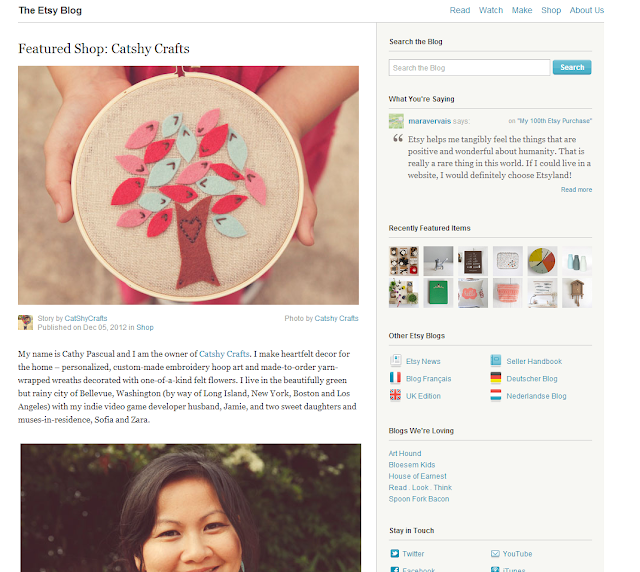 I am beyond excited to announce that Catshy Crafts is the Featured Shop at Etsy today! When I got the convo asking me to be featured, it took several days for it to sink in. I was shocked to say the least. And a little wary. I was nervous about the interview. And the photographs to be taken. And my studio! What a mess. I went on a 3-day cleaning binge to get in order for my photographs. And now that the day is here, I'm still in shock. But I am trying to let all the positive feedback in and enjoy the moment. I also wanted to thank all the people who have supported my shop -- both as customers and cheerleaders on my blog, Facebook page, Twitter page and at the etsyRAIN craft show. My family! Jamie, my husband has ALWAYS been supportive of me finding my outlet (from when I was a scrapbooker to photographer to Etsian). He's never complained when I bought the "toys" and tools I've needed for my craft (from a dSLR camera to a photo printer to all my trips to Joanns and Michaels). He's the best! My daughters, Sofia and Zara for being my models and #1 fans of my works. For all the oohing and ahhing over my little pieces and always wanting me NOT to sell a piece so that they could keep it for themselves! My sisters (one of whom has an Etsy shop too - while being a full-time costume designer in Chicago) and the rest of my family back on the East Coast. My in-laws, especially Dianne, who is shares a love for photography and creating. My friend Hannah for giving me my "break" at my first art show at Cupcake Royale. For my friends Hailee and Helen for being my first customers (at the art show). My online buddies: Kristina, Holly, Joscie, Traci, Crystal, Corinne, Katrinna for always "liking" my little status updates and giving me encouragement along the way! My fellow etsyRAIN team members who I have met in person and online: Marlo, Amy, Hazel, Kelly, Kayce, Steph, Christine, Amrita, Emily and many more. And of course my customers!!! Thanks for letting me create something for you and your homes or your friends' homes! So thank you if you ever "hearted" one of my items, commented on a blog post or shared a link or bought one of my items. And as an extra special thank you, here's a coupon code for you. 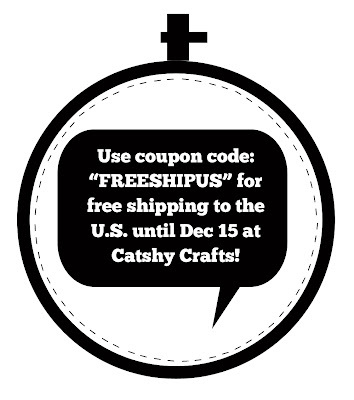 I will give free shipping to my U.S. customers just in time for the holiday gift-giving season! 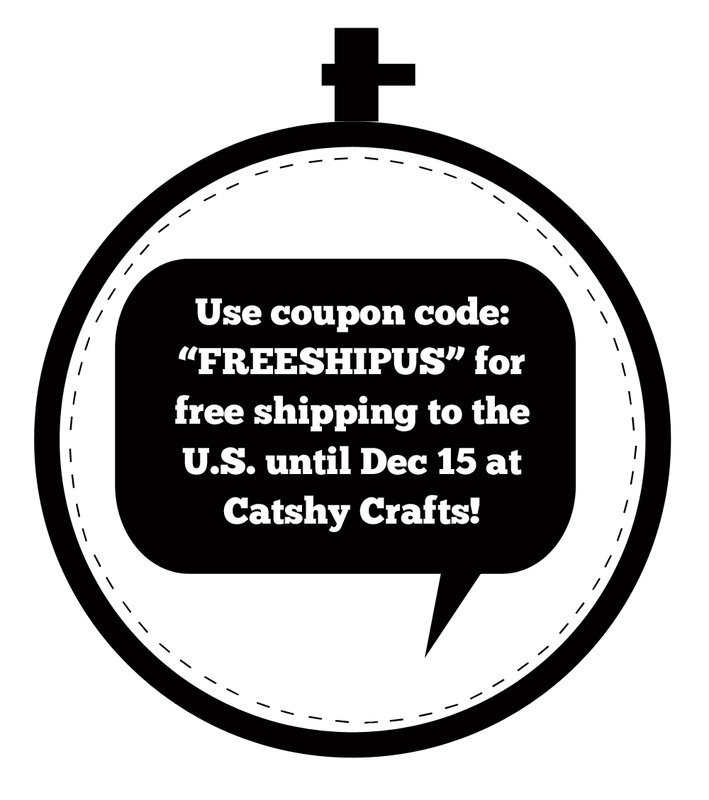 Use coupon code "FREESHIPUS" for free shipping to the U.S. until December 15, 2012 at Catshy Crafts! Congrats!! I saw you post about it on FB and I'm sorry I'm late commenting here! You deserve every bit, Cathy! So glad your business is doing great! Hugs!